Our minimum order is dependent on a number of factors. Please choose what best fits your situation below. I am collecting my goods from your showroom and I am selling within the UK mainland. I am collecting my goods from your showroom and I am selling in Northern or Southern Ireland. I am collecting my goods from your showroom and I am selling outside of the United Kingdom. You are delivering my goods within your UK Delivery Matrix. You are delivering my goods outside of your UK Delivery Matrix. I am exporting the goods and I am arranging my own collection/delivery with a carrier. Our minimum order is a strict £500 ex VAT . Otherwise the minimum order is £2000. * You can claim the VAT back once we have proof of export to Southern Ireland, please speak to your sales rep as this usually requires you to use one of our own carriers. Our minimum order is a strict £2000 and you must pay the VAT in full. You can claim the VAT back once we have proof of export, please speak to your sales rep as this usually requires you to use one of our carriers. Our minimum order is a strict £1200 ex VAT. 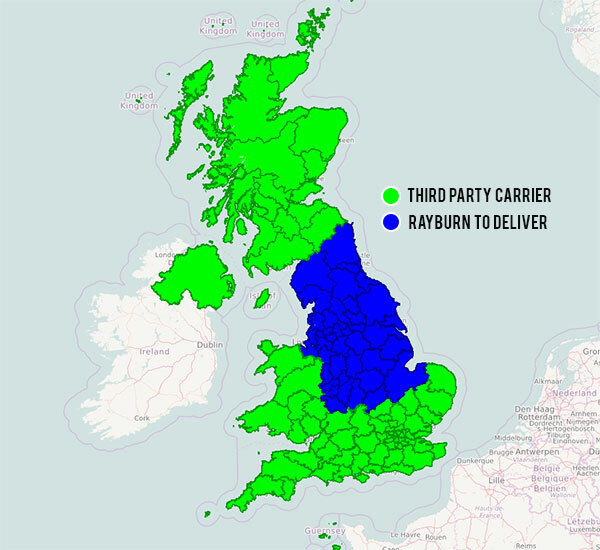 Our Delivery Matrix covers most of England, it does not include London postcodes, South Wales or Scotland. Our minimum order is a strict £2000 ex VAT. Please contact our Customer Service team if you are unsure whether you fall within our Delivery Matrix on 0161 214 1320. Our minimum order is a strict £2000. If you can, come and see us - we have over 4,000 product lines that change daily with new products & clearance items. With over 60years experience in wholesale and a worldwide customer base, we are a family owned business that strives for excellent customer service. How do I become a Rayburn customer? You can call in or contact our reception to join instantly as a payment on order customer, if you require terms then our accounts department would be happy to help during office hours Mon-Friday. Or fill in our New Customer form and a member of staff will contact you shortly. Existing customers can scan their own order in our showroom using a fob, fax your order to our showroom, place an order on this website, speak to one of our sales team direct or arrange for a rep to visit your premises. I’m a new customer, can I drop in to place an order today? If I place an order in the showroom, how long till it’s ready? While we prioritise “waiting customer” orders, the length of time to complete will vary depending on several factors in the warehouse. However, we have introduced a SMS service that will send a message to your mobile phone when the order is ready for collection – please ensure we have a correct mobile number to take advantage of this. We specialize in personalized customer service. One of our professional sales team will contact you to complete your transaction, including confirmation of availability and shipping costs. Often our sales team suggest additional products your customers will like based on your order and/or region. Can I use your photography & media? All images on the website can be downloaded and used by our customers to advertise the products for sale, higher resolution images are available on request but we reserve the right to charge for ad-hoc requests. Are there extra shipping charges for bulky goods? We do reserve the right to charge a delivery fee on certain orders if the order is comprised solely of bulky/heavy items such as drinks or kitchen/toilet rolls. You will be contacted prior to shipment. Can you deliver my goods? We have a 10-strong fleet of trucks to deliver your order within our Delivery Matrix. This is a set delivery schedule so please always ensure your order is placed 48 hours in advance of your delivery slot or you risk the order being moved to the next available slot. If your delivery address falls outside of our Delivery Matrix then we can send your order via a third-party carrier, please contact our Transport department to arrange this. IN THESE CONDITIONS THE COMPANY MEANS RAYBURN TRADING CO. LIMITED. AND THE CUSTOMER MEANS THE OTHER CONTRACTING PARTY. 1. CUSTOMERS ARE REQUESTED TO CHECK ALL GOODS PRIOR TO DEPARTURE FROM WAREHOUSE, AS SHORTAGES CANNOT BE RECTIFIED LATER. 2. IN THE EVENT OF THE CUSTOMER HAVING ANY CLAIM AGAINST THE COMPANY, THE CUSTOMER SHALL NOT BE ENTITLED TO WITHHOLD PAYMENT OF ANY MONIES DUE TO THE COMPANY IN RESPECT OF GOODS ORDERED BY THE CUSTOMER. ANY SUCH CLAIM SHALL BE DEALT WITH AS A SEPARATE MATTER AND IN THE EVENT OF THE COMPANY BEING LIABLE TO THE CUSTOMER, THE COMPANY SHALL CREDIT THE CUSTOMER WHEN LIABILITY HAS BEEN ASCERTAINED. IF GOODS ARE TO BE RETURNED TO STOCK ONCE PALLETISED THERE IS A MINIMUM £50.00 RESTOCKING FEE PER PALLET. (1) THE GOODS SHALL REMAIN THE PROPERTY OF THE COMPANY, BUT THE RISK THEREIN AND ALL LIABILITY TO THIRD PARTIES IN RESPECT THEREOF SHALL PASS TO THE PURCHASER ON DELIVERY. (2) THE PURCHASER MAY SELL THE GOODS IN THE NORMAL COURSE OF ITS BUSINESS BUT SHALL HOLD AND PURSUE CLAIMS FOR THE PROCEEDS OF THEIR SALE EQUAL TO THE PRICE OF THE GOODS FOR AND ON BEHALF OF THE SELLER.